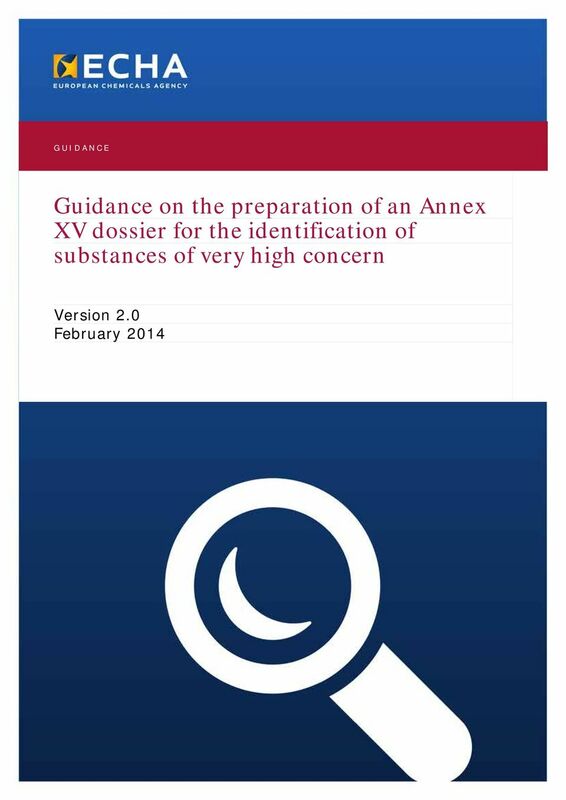 Download "Guidance on the preparation of an Annex XV dossier for the identification of substances of very high concern"
3 Guidance on the preparation of an Annex XV dossier for the identification of Version 2.0 February Preface This Guidance Document describes how the authorities (Member States Competent Authorities or the European Chemicals Agency) can prepare a dossier in accordance with Annex XV to identify a substance of very high concern under. 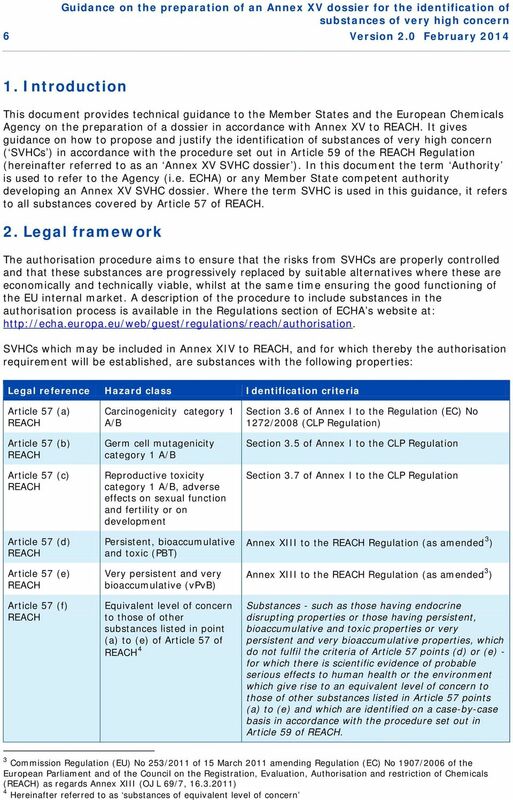 It is part of a series of guidance documents that aim to help all stakeholders with their preparation for fulfilling their obligations under the Regulation. 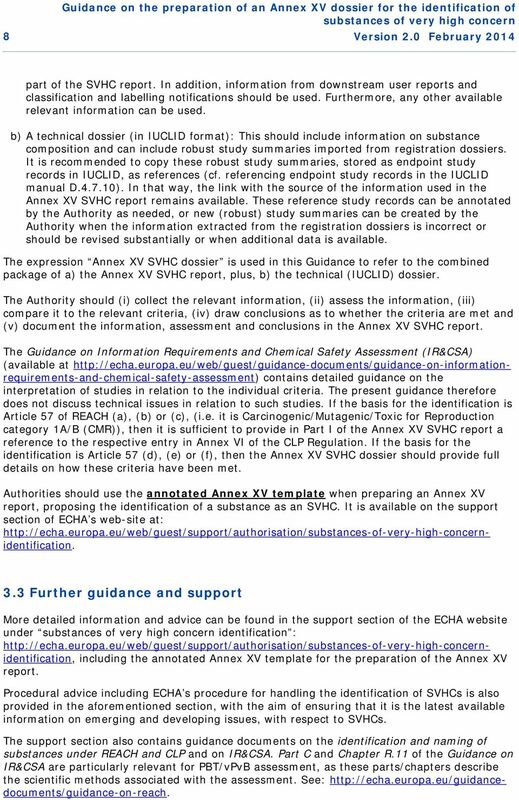 These documents cover detailed guidance for a range of essential processes as well as for some specific scientific and/or technical methods that industry or authorities need to make use of under. 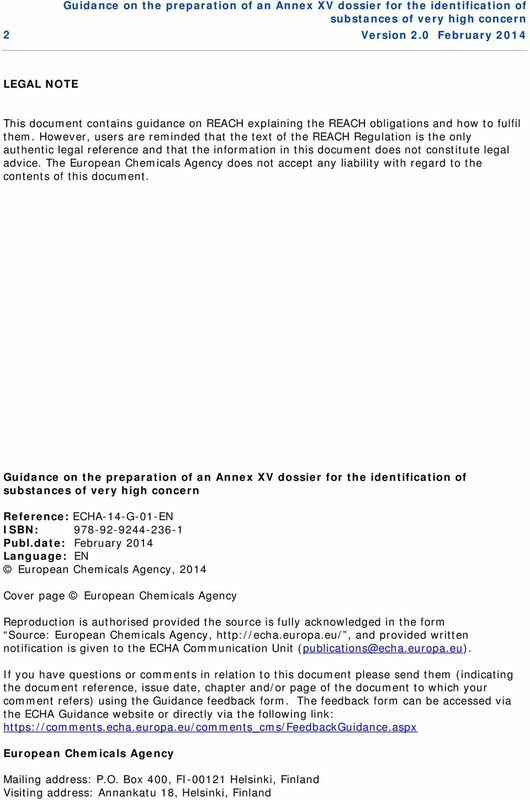 These guidance documents can be obtained via the website of the European Chemicals Agency ( The legal references for the document are Regulation (EC) No 1907/2006 of the European Parliament and of the Council of 18 December 2006, concerning the Registration, Evaluation, Authorisation and Restriction of Chemicals (the Regulation) 1 and Regulation (EC) No 1272/2008 of the European Parliament and of the Council of 16 December 2008, on classification, labelling and packaging of substances and mixtures 2. 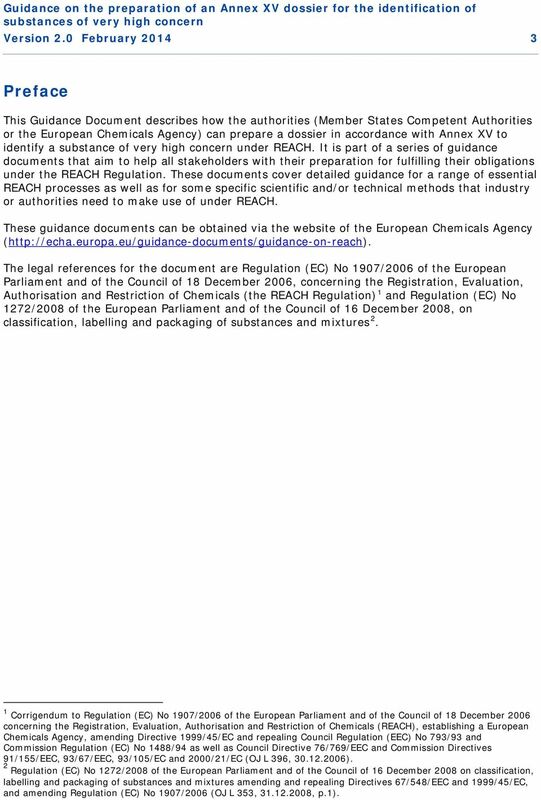 1 Corrigendum to Regulation (EC) No 1907/2006 of the European Parliament and of the Council of 18 December 2006 concerning the Registration, Evaluation, Authorisation and Restriction of Chemicals (), establishing a European Chemicals Agency, amending Directive 1999/45/EC and repealing Council Regulation (EEC) No 793/93 and Commission Regulation (EC) No 1488/94 as well as Council Directive 76/769/EEC and Commission Directives 91/155/EEC, 93/67/EEC, 93/105/EC and 2000/21/EC (OJ L 396, ). 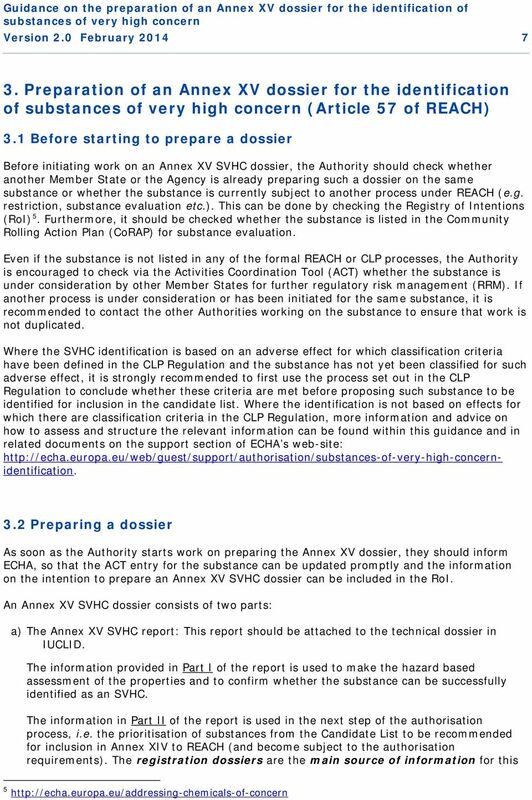 2 Regulation (EC) No 1272/2008 of the European Parliament and of the Council of 16 December 2008 on classification, labelling and packaging of substances and mixtures amending and repealing Directives 67/548/EEC and 1999/45/EC, and amending Regulation (EC) No 1907/2006 (OJ L 353, , p.1). 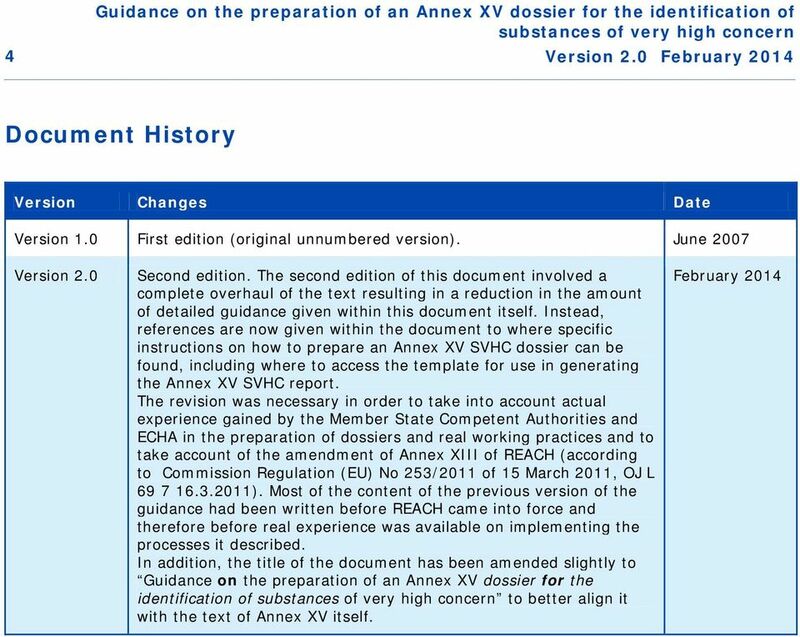 9 Guidance on the preparation of an Annex XV dossier for the identification of Version 2.0 February What to do when an Annex XV dossier is not appropriate There may be cases where the Authority carries out work on an Annex XV dossier but concludes that there is no need for a dossier at this point in time. In such cases, it is important that the work that has already been undertaken is not lost, but is made available for potential future work. Thus, the Authority is encouraged to record the results of the work it has carried out via the ACT. A simple description of the work undertaken and the reasons why it was decided not to proceed may be sufficient.